I’m a serious introvert. It’s made my career in sales a massive challenge. I’ve managed to make it work, but I’m generally the guy in a crowd face down in my phone or a book, rather than chatting up strangers. Small talk is physically painful. Thus my experiences this weekend were jarring. Twice I was approached by random folks, insisting that I looked like a celebrity. If only I could monetize that resemblance, I could get out of the sales gig. I corrected him, as Ron (as far as I can recall) always wore a nicely-trimmed mustache. Last time I shaved the beard down to just a ‘stache, the wife sternly ordered me to shave instantly. 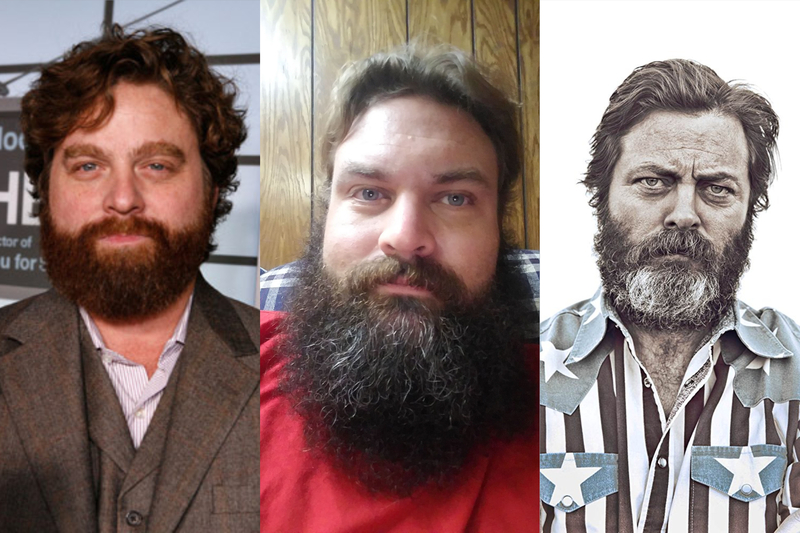 But it seems the actor behind “Ron,” Nick Offerman, often wears a full beard, with a similar patch of grey on the chin. So I can see it. Plus, I’m also a libertarian. So, it seems I can be any bigger dark-haired guy that wears a beard. I’m a little weirded out by the fetish people seem to have about my beard, actually. I’ve had people ask to fondle my whiskers – a request that might have been granted a couple of decades ago when I was single, but kinda creepy when it’s a middle-aged dude. People will shout across the street – “DUDE! EPIC BEARD!” How am I supposed to respond to that? At a Memorial Day parade this spring in Gettysburg, the gentleman portraying Honest Abe called me out, complimenting me on my chin growths. A pair of English journalists cornered me in a crowded Slows BBQ this past January during the auto show, complimenting my follicular fortitude. I suppose I should be thankful. I’m not one to attract attention, despite my above-average size making me stand out – I’ve always relished the ability to shrink into crowds. But can this newfound “fame” be useful? Honestly, though, if one were to change up the feature being complimented, would this be acceptable in modern society? Turn the tables by changing the gender – can people today get away with vocal, public comments on, for example, a woman’s breasts? Fifty years ago, in the Mad Men era, I’m sure it’d be fine…but in this enlightened era of MeToo, it can’t be ok. Mind you, I’m not trying to equate my beard experiences with those of anyone who has been the victim of any number of lecherous men in varying positions of power. My minor discomfort with being singled out for my beard is nothing in that context. I’m curious who else reading this has a similar experience. Do you have a celebrity doppelgänger? Or do you have some physical feature that elicits comments from strangers?